The color of this satin shirt really pops in person. I took the pic on a cloudy day. since it's a reproductions 70s shirt. The burnt orange colored fabric has a crinkled texture and is highly reflective. 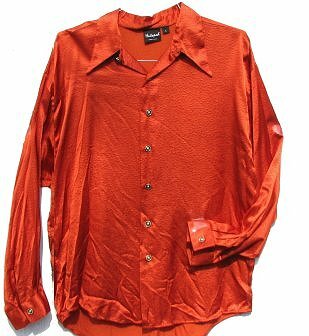 The real satin shirt is perfect for a 70s theme party. It would look great with about any pair of brown polyester pants. It will fit a size 42 chest, a today's size L.
I would recommend hand washing or dry cleaning after wearing.